Once all the pre-wedding and the actual wedding ceremonies and rituals finalize, a very large wedding reception begins. 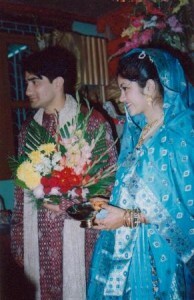 However, it is not unusual for an Assamese style wedding, to have a wedding reception even a week before the actual wedding. The Assamese wedding reception resembles an American open house party, with a beautifully served buffet style meal, consisting of myriad of selections of fruits, sweets and an abundance of deliciously prepared dishes of fish and meat. The reception area is elaborately decorated with lots of greenery and beautiful floral arrangements. The bride and groom have a special reception area set up, where they greet all their guests, coming up to them one by one, wishing them well, and presenting them with bouquets of flowers, and gifts. After the greeting, the guests step up to the buffet, enjoy a meal, and leave the reception shortly afterward. All the singing and dancing already took place during the pre-wedding celebrations. There is no traditional wedding cake, nor any dancing and partying at the reception, unlike at a traditional American wedding. Please note the bride and groom are wearing different outfits for the reception. This bride chose a white sari for her wedding, but a beautiful blue one for the reception. She is wearing a headdress for all the ceremonies associated with the wedding. Also notice the numerous jewelry on her, as these were given to her as gifts by her in-laws and other family and friends as wedding gifts during pre-wedding ceremonies. After the wedding ceremony, the bride visits the groom’s house, her future home, and the Ghar Gosoka ceremony takes place. The bride visits the groom’s home for the first time after they’ve been married. The bride and groom go to the groom’s home accompanied by the bride’s brother, cousins, and close friends. The bride will participate in special ceremonial activities in the groom’s home, and play games with the groom’s immediate family. After seeking blessing from the Lord, the bride along with her brother, cousins, and close friends, leaves the groom’s house, to return to her own home. The groom remains in his own home that night. The next day everyone stays at home and relaxes, and bid farewell to out of town guests, who are returning home. Two days after the wedding, the bride will be escorted by her brother and cousins to her new home, the groom’s house. This ceremony is called Bidaai. The bride throws rice over her shoulder as she leaves her home, to ensure that prosperity continues in her home, as well as follows her into her new residence. I also came upon a slightly different version of this tradition, which here is called Datar. After the family and friends greet the newly weds, they leave for the grooms house, the new home for the bride. As they arrive at the grooms house, his parents lift her feet, place a headdress over her head, and she sprinkles milk in all corners of their home, which signifies her respect towards her new family, her promise to diffuse any misunderstandings, and to maintain family unity. The bride also picks up a handful of salt and places it in the groom’s hands, and he in turn returns the salt back to her hands, repeating the process three times, without spilling any of the salt. The Datar is carried out with all the members of the bride’s new family. There is another post-wedding tradition for the bride and the groom to participate in, and it takes place eight days after their wedding. This ceremony takes place at the bride’s parent’s home. This is the first time for the newlyweds to visit the bride’s parent’s home, together, after their wedding. Eight special dishes are prepared to honor this occasion. This ceremony is usually very informal, and it normally includes only close family members. I really enjoyed researching the information about Hindu Weddings, and interviewing Rishi and Ria about their Traditional Assamese Wedding, as well sharing their pictures. It almost feels like I just attended one of these weddings. If you had the pleasure of attending an Indian wedding, it would be very interesting for all of us to hear about your experience.